What to Expect: On the Reflection Lakes hike, you will observe 10 different wildflower species at 11 different locations along a system of trails trails that runs north to south and across approximately 2000 feet (600 meters) of elevation. The 5.5 mile round trip Reflection Lakes hike consists of the east branch of the Lakes Trail to the Skyline Trail and finally to the Paradise Glacier trail. We recommend hiking and collecting data on the way uphill, all plot descriptions in both pamphlets are written assuming this. The hike can take anywhere from 4 to 8 hours depending on trail conditions, your plant identification experience and how fast you hike. How to Get There-Reflection Lakes: Once you are within Mt. Rainier National Park, follow the signs to Reflection Lakes/Ohanapecosh and park at the far Reflection Lakes parking lot (there are 2). Walk east along the road approximately 0.1 miles. Walk along the new granite and stoned lined sidewalk and look for signs to the Wonderland Trail. Proceed along the trail to the first plot and follow the directions in your pamphlet to the rest of the plots. Return the way you came on the trail and drive back down the mountain. 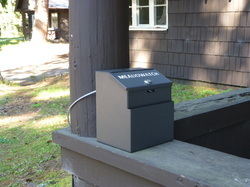 Drop your data sheet on the brown metal box on the porch of L-112 (Employee Lounge) at Longmire. The Employee Lounge is directly behind the Wilderness Information Center. Below are maps of the Reflection Lakes plots for your reference. Also check out the Interactive Google Map. What to Expect: On the Glacier Basin hike, you will observe 10 different wildflower species at 17 different locations along the Glacier Basin Trail, covering approximately 1300 feet (400 meters) of elevation. It is a 7 mile roundtrip hike. We recommend hiking and collecting data on the way uphill, all plot descriptions in both pamphlets are written assuming this. The hike can take anywhere from 4 to 8 hours depending on trail conditions, your plant identification experience and how fast you hike. How to Get There- Glacier Basin: Enter the park at the east side entrance heading toward White River/Sunrise and follow the signs to the White River campground. To start your hike, park at the climber and picnicker parking lot in the White River campground, and walk through the D Loop of the campground. 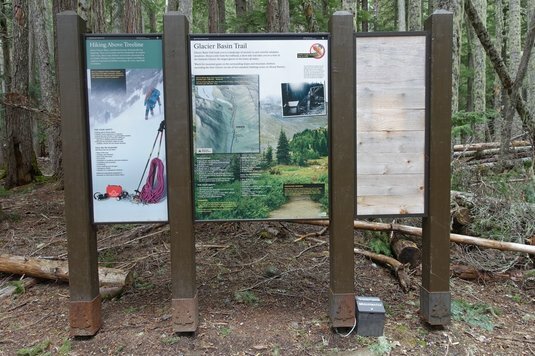 At the beginning of the trail, you will see an information sign about the hike and surrounding area. The brown metal box, which you can leave your completed data sheets in, is chained to the sign post on the ground. Your hike will climb approximately 1,600 feet (~500 meters) of elevation. Our directions to each plot are written assuming you will be collecting data uphill. 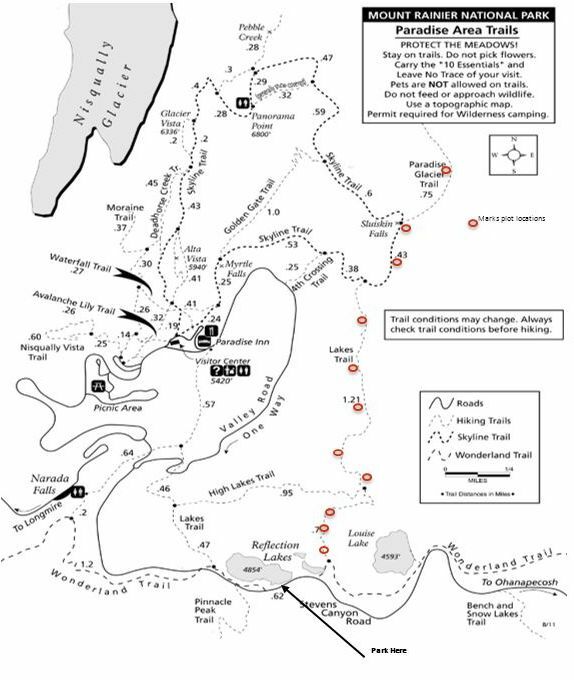 Below is a map for the Glacier Basin hike plots. You can also check out the Interactive Google Map.